Management of trauma patients by junior doctors is common in South Africa. Recent literature published in South Africa and observations of various senior doctors have raised the concern that the newly qualified doctor lacks both knowledge and skill in the management of trauma patients, and especially those with orthopaedic injuries. 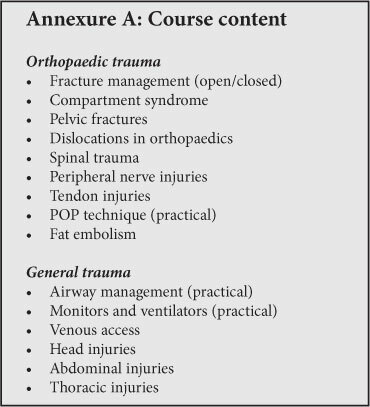 A general trauma course with an orthopaedic focus was developed for newly qualified doctors to address these concerns. The course was assessed by using a questionnaire before and after the course. The post-course questionnaire showed significant improvement in newly qualified doctors' knowledge of trauma management. A general trauma course with an orthopaedic focus was developed by the authors to improve house doctors' knowledge of managing trauma patients. This course appears to be the first of its kind and there is no reported course that it can be compared to. House doctors are randomly placed at state hospitals from various universities in South Africa and are often overwhelmed by their first contact with trauma patients. The authors are of the opinion that a structured approach to trauma of this nature will be most beneficial for the junior doctor. After the successful development of a house doctor trauma course with an orthopaedic focus the authors decided to assess the course by analysing the participants' pre- and post-test results to see if any improvement could be measured. A trauma course was designed by the authors with input from the surgical and emergency medicine departments to address the lack of interns' trauma knowledge and skill, with the major focus on orthopaedic trauma. The aim of the study was to assess the efficacy of this course in improving the competence of a group of interns in trauma management. The course was developed and presented at the Pelonomi Hospital, Bloemfontein, Free State, which is a secondary and tertiary referral centre with a dedicated trauma unit. The trauma course was presented in a single day from 07h30 to 17h30, including lunch and tea breaks; the duration was 10 hours. There was no financial gain from the course and the instructors donated their time voluntarily. The course has been made compulsory by the Department of Orthopaedics and has been designed to complement ATLS (Advanced Trauma Life Support). Interns are encouraged to attend an ATLS course for their career development. Lectures and practical demonstrations were presented by various consultants and registrars from orthopaedic and emergency medicine departments. The lectures are designed on an intern level and are based on the minimum management expected from a referring doctor for a trauma patient. The lecture topics and course programme are provided in Annexures A and B. The study is a descriptive retrospective study looking specifically at interns who attended the Intern Trauma Course. Their pre- and post-course knowledge was evaluated. The study population was the group of newly qualified interns from South African medical schools working at the Pelonomi-Universitas hospital complex that attended the Intern Trauma Course during 2011. All interns were included in the study and there were no exclusion criteria. 1. Choose the correct answer to the following multiplechoice test items from the options provided. More than one answer may be considered to be correct. What is included in the initial management of open fractures? a) Intravenous fluid must be given till the patient is normotensive. b) A patient in neurogenic shock can have a tachycardia. c) Inotropes are rarely indicated. d) A patient in neurogenic shock typically presents with warm extremities and a bradycardia. e) A patient in neurogenic shock typically presents with an absent bulbocavernosus reflex. The two tests were of comparable difficulty, and this was validated statistically. Similar mean and median results were recorded with both pre- and post-tests, suggesting that the tests were of comparable difficulty (Table I). More than one right answer per question was allowed, with half a mark deducted for each incorrect answer to discourage guessing. The minimum possible score for each question was zero; even though half marks were deducted the candidate could not receive less than zero for an individual answer. The pre-test was taken on the day of the course and the post-test was taken 2 weeks after the course, during which time interns could review the course material made available at the start of the course. All registrars in the Department of Orthopaedics completed the test to act as a control group. The minimum and maximum points scored, and the mean and median scores for the pre- and post-course tests were compared. Descriptive statistics, viz. averages and standard deviations or medians and percentiles for continuous data, and frequencies and percentages for categorical data were computed. 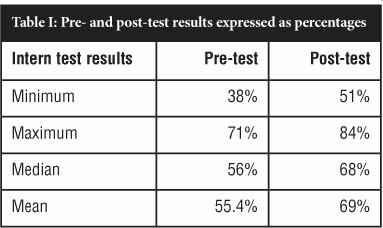 Pre- and post-test scores were compared by means of a paired t-test and also compared to the control group. The analysis was performed by the Department of Biostatistics, UFS. Approval for the study was obtained from the Ethics Committee of the University of the Free State. Permission was obtained from Professor J Shipley, Head of the Department of Orthopaedics, to use data obtained from the Intern Trauma Course pre- and post-tests. Results were known to the investigators only and would remain anonymous for the purpose of the study. A group of 37 interns completed the course in 2011. A significant improvement in the interns' results following the course was found in all four parameters assessed (Table I). The average of the control group of registrars for the test was 72% which was similar to the interns' post-course results. The level of the registrars tested varied from their first to final year. This group deals with general and orthopaedic trauma regularly and provides a reliable baseline level of what the basic working knowledge should be for junior doctors dealing with general and musculoskeletal injuries. The registrars wrote only the pre-test as the multiple-choice test items were similar in both pre- and post-tests. The registrars did not attend the intern course; therefore the post-test was not applicable. Both the median and mean values improved by margins of 12% and 14% respectively. The percentage improvement of individual interns showed that there was no improvement in the results of only three of the 37 interns. A comparison of the pre- and post-course test results using arbitrary values of 60% and 70% shows that there was significant improvement in the knowledge gained during the course. While 28 candidates (76%) scored below 60% before the course, only one (3%) failed to score 60% after attending the course; while only one intern (3%) scored above 70% before the course, 19 (51%) obtained a score higher than 70% after attending the course. Statistical analysis of the improvement in the above scores after the course gave a Pearson correlation coefficient of 0.46801, p-value 0.0034, and the paired t-test a value of -10.32, probability <0.0001. The interns' pre-test results confirm the observation that newly qualified South African interns lack knowledge of and skills in managing general and orthopaedic trauma. These findings support those of two recent South African studies. No other literature relevant to this problem appears to have been published. Naidoo et al.1 assessed the quality of orthopaedic referrals to King Edward VIII hospital, a secondary and tertiary level hospital. They found a 16% diagnostic error, poor documentation of essential information and failure to provide basic orthopaedic management in a high percentage of emergency referrals. They concluded that supervision, training and regular assessment of junior doctors is essential to improve the quality of patient care. Dachs et al.2 point out that undergraduate students in South Africa receive an average of only 6 weeks training in orthopaedics, and that many do not do trauma calls as students. This suggests that South African students' training in the theory and practice of orthopaedics and trauma is inadequate. In their study a group of first year interns were assessed by the Freedman and Bernstein Musculoskeletal Questionnaire and only 9% passed the examination, confirming the alarmingly low standard of the orthopaedic knowledge of these newly qualified doctors. South Africa has a very high incidence of orthopaedic problems, especially trauma, and it is often junior doctors who are responsible for the diagnosis and management of such patients. In this regard the deficiencies in undergraduate orthopaedic training found in this and previous studies pose a serious threat to medical services in South Africa and show the need for additional teaching. While long-term planning to modify the training system is essential, short-term measures to improve the interns' competence in these critical areas are also important. The ATLS course focuses on management of acute surgical emergencies with little emphasis on orthopaedics. The authors have developed a one-day training course to address this problem and have now tested its practical value in a group of interns. The results show that the interns' knowledge can be improved to a level matching that of a group of orthopaedic registrars by such a course. It is very difficult to translate an improvement in test results to an improvement in clinical practice. It does, however, provide baseline and more focused knowledge, and an indication of what is expected in practice to manage trauma patients successfully on the level of a junior doctor. The positive results achieved from the trauma course will hopefully have an impact on trauma patient management in the near future in our hospital group, but it would be worthwhile to include interns from smaller hospitals to improve peripheral orthopaedic service and referrals. Other medical schools should be encouraged to offer similar training to their interns at the start of their surgical and orthopaedic block as that is when these skills are most necessary and likely to be retained. Compulsory completion of such a course before registration with the Health Professionals Council could be considered as a measure to improve trauma emergency management. The study has shown positive results resulting from a general trauma course with an orthopaedic focus for newly qualified doctors. These are, however, short-term results and the testing would need to be repeated after a predetermined period to assess long-term outcomes. If longterm results prove to be significant, the completion of such a course could be recommended to the Health Professions Council as a measure to improve the management of trauma emergencies. Neither of the following authors nor any of their immediate family members have received anything of value directly or indirectly related to the subject of this article: Dr DP Vermaak; Dr JWT Potgieter.